Is it time for cycling to unhitch its wagon from the Armstrong legacy? I don’t blame people for wanting to believe. Sporting heroes play an important part in the lives of so many. They offer an escape from the mundanity of the nine to five, make us feel that, no matter what difficulties we face ourselves, we can rally behind someone else’s quest to conquer the Alpe d’Huez of life. Lance Armstrong understood that. He realised that if he stood for something, if he created something to believe in, people would follow him. Armstrong had been diagnosed with cancer. Not only did he beat that disease, one that touches so many people directly or indirectly and so strikes a very real chord with all of us, but he came back and won the Tour de France. Not once but seven times. In a row. It was a miracle. The sporting story of not just this generation but any generation. A Hollywood tale that wasn’t projected onto a silver screen but took place on the road – and you could go and watch. You could be part of it. You could yell in his ear and contribute in a small way to the drama. It was hardly surprising the sport of cycling and its authorities also rallied behind Armstrong. They saw the commercial success he had created, marvelled at the riches he attracted, and wanted to bathe in the trickle down. And together we all allowed one man to dominate the sport, to its detriment. The Tour de France became the Tour de Lance. It was just a moderately amusing pun at first but soon it stood for more. No man is bigger than the sport, you say? Well, Armstrong came closest of all to being just that, certainly in the eyes of people who do not follow the season from Het Nieuwsblad to Lombardy. A lot of people enjoyed it. But some did not. Some knew a little of what was happening and tried to speak up only to be trampled underfoot in the stampede to hail the chief. He wielded power. He snapped and snarled at his foes, real and imagined. He chided Christophe Bassons and chased down Filippo Simeoni. Like a mafia don he selected a chosen few and cultivated them. They were granted access to tell ‘The Story’ and everyone else could trot along in their wake. Want to hold a contrary opinion? You’re wrong. You’re either with us, or against us. He inspired in some – many who should have known better – an obsequious need for approval. It was nauseating to watch at times. It still is. As he was an atheist, it was odd to see Armstrong embrace this almost God-like status. There was even his version of The Bible – It’s Not About the Bike. The Bible didn’t manage a sequel. Armstrong did. 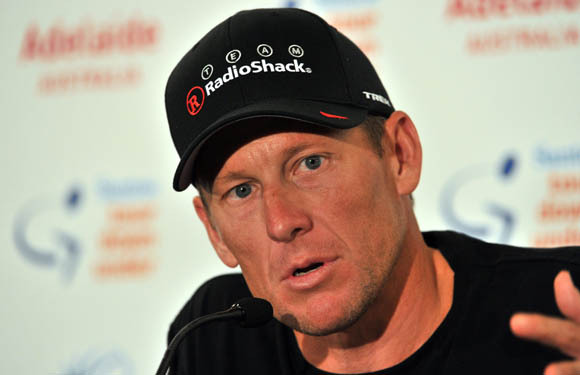 The Lance Armstrong story is so convoluted, so conflicted. It’s like a tightly knotted piece of string. Myth at one end, truth at the other. And now it is unravelling so fast it is understandable that those who have held on so firmly to the myth end feel shaken and unsure. However, those who have wanted to get to the other end of the string are still a way from feeling vindicated because Armstrong continues to deny. You get the feeling that this one is going to go all the way. Last year Floyd Landis got the ball rolling. Landis, who doped and was stripped of a Tour de France title, was easy to discredit. Armstrong and his PR strategist Mark Fabiani (insert your own comedy music here) planted the seed and Armstrong’s followers did the rest. It was the drinking, or the bitterness eating away at Floyd, or revenge, or a desperate need for money. Like Greg LeMond and Betsy Andreu and others before and since them, Landis found that if you questioned the story, you had better brace yourself for some time in the stocks. The supporters stuck by their man. Until someone close to Lance turns, this is all just BS, they said. Tyler Hamilton, a man who rode himself into the ground for his buddy at the Tour de France in 1999, 2000 and 2001, alleged to the CBS News 60 Minutes programme that he and Armstrong used EPO, that he saw EPO in Armstrong’s fridge, that he saw Armstrong injecting it. Armstrong was quick to deny. Tyler’s just desperate for a book deal, said Fabiani. And for a few hours some people bought that too. On Friday, I did half a dozen interviews with BBC Radio and in three of those interviews was asked by researchers or the presenter: “This is all to do with trying to sell a book, isn’t it?” Though we may look at Fabiani’s work as staggeringly unsophisticated, it works on the masses. It’s dog whistle PR. Hamilton, who cheated and then lied about it for years, did have something to lose. His Olympic gold medal, won at Athens in 2004, shortly before he tested positive for a banned blood transfusion. Hamilton fought tooth and nail to keep that medal and he did so on a technicality. He had to reach next summer to pass the IOC’s eight-year statute of limitations and keep it for good. Now he will hand it back. Armstrong Tweeted: “Congratulations to @eki_ekimov on his 3rd Olympic Gold Medal! !” That was a reference to his former US Postal Service team-mate, Vjatcheslav Ekimov, who was second to Hamilton in that Athens time trial. It appears Armstrong has no problem with titles being retrospectively stripped in such circumstances. Good to know. You can question the wisdom of Hamilton choosing to speak to 60 Minutes and argue that it might have a detrimental effect on the outcome of the Food and Drug Administration’s investigation into doping in cycling, which centres on Lance Armstrong and the US Postal Service team. But to suggest that Hamilton decided to talk because he has a book in the offing is stretching things. He was called to testify before the grand jury, where lies can land you in jail. Surely that’s a more compelling reason? Yesterday’s mantra was that Hamilton, like Landis, is a cheat and a liar. He was lying then, so how can he be telling the truth now, goes the twisted logic. Call us when someone really close to Armstrong starts to talk. Someone like Big George. Tick, tock, tick, tock. Just 12 hours passed. CBS News has now reported that Hincapie has testified that both he and Armstrong supplied each other with EPO and discussed having used testosterone, another banned drug, to prepare for races. Et tu Brute? Then fall Caesar. On the face of it, that is a reasonable point even if the ‘move on’ brigade is largely populated by apologists and those who find confronting difficult realities troubling. But Hincapie is wrong. Who wants a future based on decades of lies? Now is the time for cycling to unhitch its wagon from Lance Armstrong once and for all. The sport will never iron out all its flaws, the crevices run too deep for that, but real progress can be made. This could turn out to be an opportunity to run through the sport with a leafblower, expelling the dead wood and allowing those with drive, determination and vision to construct a bright new future from what is a beautiful, glorious and heroic pursuit. But it has to be done without the shadow of Armstrong looming large. To all intents and purposes his legacy must be reduced to nought. It must be seen for what it was. An era where the doping contest was the equivalent of an arms race. Take a look again at the top tens from every Tour de France, Giro d’Italia and Vuelta a Espana since the Festina Affair in 1998. Take a look at every stage winner. Strike through the name of every rider caught doping, or who has confessed, before or since. Then tell me I’m wrong. The Festina Affair should have been our watershed. As laws were introduced across Europe and police forces woke up to the extent of the organised, criminal trade and traffic of drugs which were never intended to be used by athletes, cycling should have taken far greater heed. Then, in 2006, came Operacion Puerto, the blood-doping scandal surrounding Dr Eufemiano Fuentes. Another chance for an amnesty, a truth and reconciliation session and a sensible, mature approach to the future offering athletes immunity for their past conduct as long as they embraced a completely clean future. Another chance was missed. Now this should be the sport’s defining moment. But it will take courage and strong leadership and a desire from people who genuinely care for the sport’s future to make difficult decisions and stand by them. Earlier this week Pat McQuaid, the UCI president, suggested that anyone who has been suspended or has confessed to doping be barred from running a cycling team. And on the face of it that sounds an extremely sensible suggestion. Let’s break the chain. Let’s prevent one generation of blatant cheats from becoming the encouragers and enablers of tomorrow. But let’s hold on a moment and not throw the baby out with the bath water. Let’s give those who are capable of change, those with the courage to publicly condemn cheats and cheating a chance. That means bringing an end to the weasely culture of silence. They must band together, stand up and impose their will on the peloton, not simply hold their honorable beliefs under their breath. What on earth good does that do? This was in the aftermath of Armstrong’s positive test for a corticosteroid early in the race. The storm had quietened down after Armstrong had provided a back-dated Therapeutic Use Exemption form to authorise the use of a cream to treat a saddle sore, he said. Nevertheless, it was a positive test, which puts a dent in Fabiani’s much loved ‘Never Tested Positive’ defence. Later in that race Armstrong won at Sestrière with a blistering attack – one L’Equipe said put the rider Sur une autre planète. The headline, in huge letters, couldn’t have been more loaded with double meaning. As time went on, my own scepticism grew. There were murmurs of dissent but they were swept away by the tide of overwhelming interest in this miracle story. It’s true that Armstrong was good copy. He sold newspapers and magazines, he drove up interest in the Tour de France. After Festina, the Tour de France needed a ‘good news’ story and, for many, Armstrong provided it. On a purely sporting level, I did not enjoy the way US Postal Service and later Discovery Channel subtly altered the way the Tour de France was raced. Their strangulation tactics in the mountains were boring. Together, they set such a fierce pace on the climbs that his rivals had no hope of attacking. They kicked the life out of the race to set Armstrong up for the grandstand finish. To the uninitiated this was great, exciting, racing. Panache writ large. My argument was that Armstrong’s reliance on one devastating attack and the long time trial every year was formulaic and dull. I wrote an article putting forward the point of view and experienced a minor backlash. At times it felt like criticising Armstrong was akin to arguing that all children should be rounded up and drowned. And the hoopla that followed every Tour win took the sport further away from some of the things that I identified in it as appealing. This was no dignified show of strength. Armstrong appeared to seize on perceived slights, turned them into a festering need for revenge and then ground his rivals into the dirt. Some people love that kind of thing, and that’s absolutely their prerogative. But it was not attractive to watch. He did the same with his detractors and accusers too. And that was even uglier to see. They were isolated and bullied and their voices were ignored, partly because of the risks involved. The most compelling defence from Armstrong’s most stoic and determined supporters is that his charity work transcends sport and will suffer a terrible blow should he take an almighty fall from grace. Whatever he did on the bike evaporates when put up against the tremendous good his foundation has done, says the argument. There are plenty of other cancer charities that do excellent work (just as there are superb charities for other causes). It’s time to cut up the little yellow wristbands and donate a few pounds to one of the other charities. Of course, it must be stressed that so far, the case against Armstrong consists of allegations which he entirely denies. His PR machine is formidable. But federal investigations don’t take PR into account.